And I know Emma‘s excited about this one, so I had to share it pronto. As you may know I currently don’t have a laptop anymore. My laptop crashed and I now have to work from uni computers, which means I don’t have access to a lot of my photos. I had many more pictures of this recipe but I can’t show them to you, sorry! Above is what the chunky monkey recipe looks like (top left), and with added blueberries (top right). 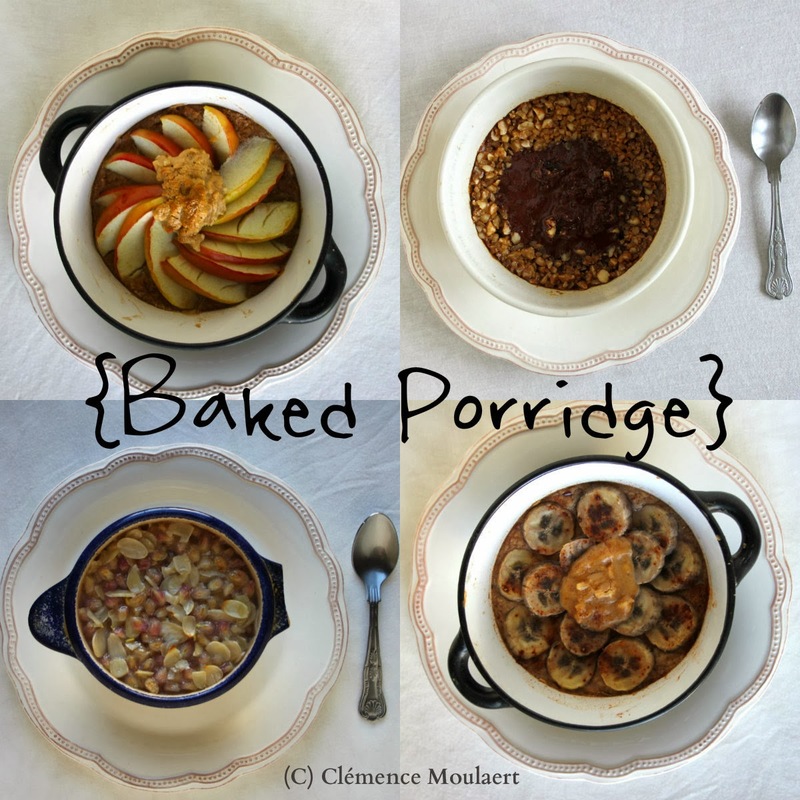 The bottom image on the collage is my Apple Pie Baked Porridge. Click here for my Pecan Pumpkin Pie Baked Porridge. 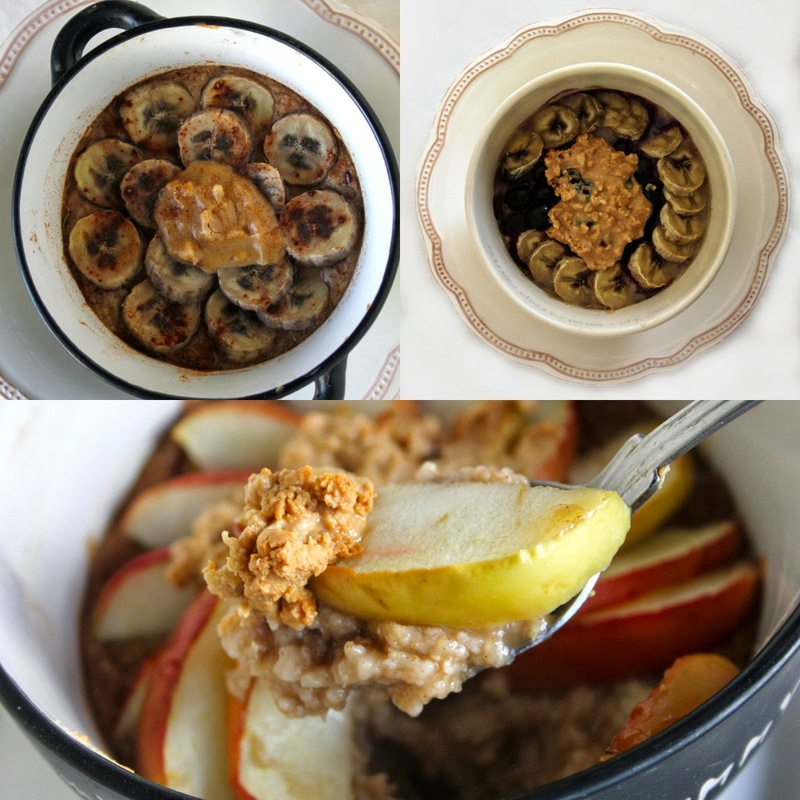 In an oven-proof bowl, combine the milk, water, spices and oats. Let the mixture stand so the oats can absorb the liquid whilst you prepare the toppings. Slice the banana and place the slices in any pattern that you like on top of the porridge. I like to arrange them along the edges, layering them towards the centre until I run out of banana slices. Drop a dollop of chunky peanut butter in the middle. Sprinkle with extra cinnamon if you like. Is there a particular breakfast that tastes like indulgence to you? Yummy! Will be trying this one very soon, if not tomorrow. i am loving these hearty breakfast porridge. perfect for the holidays!.